April | 2011 | Beer Apprentice - Craft Beer News, Reviews, Interviews and Info. Today’s review comes from arguably the most famous and well know of the “craft beer” brewers. It’s the Samuel Adams Noble Pils from the Boston Beer Company located in Boston, Massachusetts. Some debate has been sparked as of late regarding whether or not one can still call Samuel Adams a “craft brewer.” Well, from my stand point they still are. They may not be a “micro” brewery anymore, but they definitely continue to generate numerous examples of styles that can’t be denied. The Noble Pils is their Spring seasonal. I have had this beer a few times, so I’m not going into this one completely blind. First, a bit of info from the website, samueladams.com. Samuel Adams Noble Pils is brewed with all 5 Noble hops for a distinct hop character and fresh taste. Deep golden in color with a citrusy hop aroma. 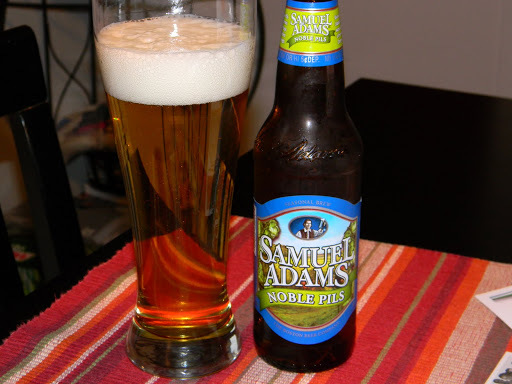 Samuel Adams Noble Pils is a traditional Bohemian Pilsner. The honeyed malt character from traditional Bohemian malt is balanced by delicate yet pronounced citrus, floral, and piney notes from the Noble hops. The winner of our 2009 Beer Lover’s Choice election, this beer was chosen by over 67,000 drinkers for its crisp complexity and refreshing taste. Well…. only one thing left to do. Drink it!!!! This Sam Adams comes in a 12 oz. bottle with an ABV of 4.9%. As you can see from the picture, this beer poured a super clear straw yellow/golden color. You can see right through it. It’s accompanied by a very bright white, somewhat soapy textured head that had nice girth and slightly below average lacing. A number of carbonation bubbles were carving a steady stream right up the middle of the glass. The aroma was suitably clean and fresh. Smells like freshly mowed grass with a few grainy hints here and there. A floral bouquet was found and followed by a lemony citrus note to add a nice little touch. The overall fragrance was balanced well, however I found it to be just a bit on the soft side. With the taste, I encountered some more of the grainy attributes mixed with a crispness revealing a lemony citrus and a ripe, green apple. A pleasant, dry, wheat tone was detected after the beer started to evolve. Minor drops of bitterness finished the savor to help balance and round off the analysis. The mouthfeel was medium/thin, dry and crisp. Nicely refreshing and thirst quenching. It did an average job covering the palate, so as to leave me with some flavor for a teasing. This is, overall, a pretty decent beer. It’s worth a try for sure. Obviously perfect for Spring and Summer because of its refreshing qualities and ease of drinkability. This beer could also be an excellent “gateway” brew for someone interested in learning about craft beer. Not overwhelming, but enough character to give you a little “kick.” I can’t help but have sentimental feelings toward this brewer because the Boston Lager was one of the first “good” beers that I ever had and one that got me going with this hobby. I still enjoy it to this day. I can’t tell you how many times Sam Adams has saved me while visiting a restaurant!!! I will say that I do appreciate all that Samuel Adams has done for craft brewing. Do they have the best brews on the planet? Probably not, however I can’t deny that they are one of the most important American brewers we have and one that I will continue to support on occasion. Do you like Samuel Adams? What is your favorite SA brew? Tonight, I must share with you my review of North Coast Old Rasputin. This is a beer that always seems to get excellent marks in the craft beer world. An underground classic, if you will. I, personally, have never had it and I can’t wait to see how it stands up. 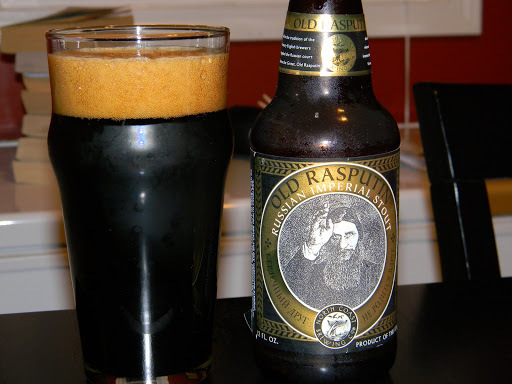 Old Rasputin is brewed by the North Coast Brewing Company (northcoastbrewing.com) in Fort Bragg, California. It’s a Russian Imperial Stout that seems to have an aura all its own. Not to mention a wicked label. Some info from the brewery. I can’t wait any longer!!!! A relatively strong beer at 9.0% ABV that pours from a 12 oz. bottle. Once I got it in the glass, the presentation was of a very dark brown/black color with minimal ruby highlights around the edges and bottom of the pint. A gorgeous tan head that was of excellent size, very fluffy, creamy and smooth looking. Prolonged retention and extensive lacing that relaxed to a smooth film, which lasted for the duration. The aroma revealed ample amounts of roasted malt. Boisterous tones of chocolate and coffee smack the nostrils along with a burnt tone of grain or barley. Some dark fruit is there, but it seems to be inhibited a bit to let the flavor of the malt really stand out. With that in mind, it does however, reveal a rich and sweet nose after it warms to room temperature. It smells good!!! With the taste, I found more of the dark fruit tones than I did in the aroma, but the burnt grain, coffee and chocolate do fall in line nicely. A taste of tobacco, but not much really. Small alcohol flavorings are observed, nevertheless they are not bothersome. They only add to the intricacy. A touch of bitterness brings up the rear to further balance the overall tone of flavor. The mouthfeel was medium/full, dry, chewy and smooth. Almost viscous like with nice carbonation. The alcohol was an enjoyable smooth burn at the back of the throat, which gave way to a warmth deep in the chest. The palate was blanketed very well so as not to let me rush the drink, but rather to savor and contemplate. Man!!! This is really a great brew that did not disappoint. It’s rich, bold and smooth. The alcohol was there for a few sips, then after a few minutes it became practically non-existent. This beer is easy to drink and enjoyable. Old Rasputin never gets boring and only increases in complexity as it warms. The high ABV and alcohol flavoring may discourage some, but for me it’s an all around great beer that is worth the money. I most certainly appreciated it. I don’t see any reason why I wouldn’t pick this up again. You should definitely give it a try if you favor Stouts. It’s a good one for sure. Let me know what you think if you have tried it. Tonight’s review comes from the Damm S.A. Brewery in Barcelona, Spain. This will be my first time experiencing a brew from the Mediterranean. I don’t really know what to expect. 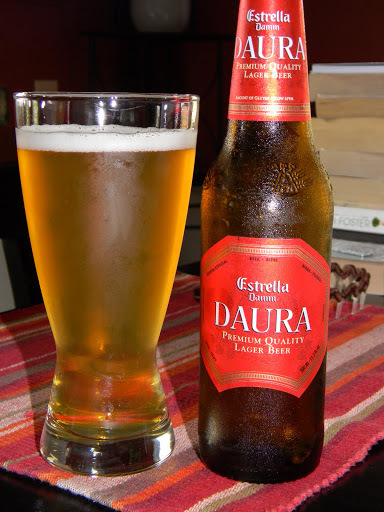 It was given to me by my friend Jay, whom I thank, and it’s called the Estrella Damm Daura Lager. I found a little bit of information about the beer from the website estrelladamm.com. Loving work and having an eye for every detail is Estrella Damm’s formula. Brewed according to the original 1876 recipe. We have no secrets. Just a job well done. We work with the farmers in the Ebro basin to obtain barley of the characteristics that our Master Brewers need. We continue to malt in our own Bell-Lloc (Lleida) malthouse, making us one of the few brewery’s in Spain and in the world, that still produces all of its malt barley in its own malthouse. Likewise, we continue to use our original recipe as our basis, including pearl rice, a very Mediterranean ingredient that characterizes Estrella’s flavour. Rice??? Hmm… Don’t know what to think about that. I guess we’ll see. This is a 5.4% ABV beer that comes in a 11.2 oz. vessel. Poured a clear straw, golden color. A bright white, soapy textured head with ok retention as well as ok lacing. Some patches of lace were left behind, however they slowly started to slide down the sides of the glass after a few swirls. Quite a few small bubbles were rising from the bottom also. I was anticipating adjunct notes before I even stuck my nose in, however the bouquet was clean and fresh. I did detect hints of wheat and grain, but I never found any aromas of rice or overly putrid, stale adjuncts. It wasn’t anything very complex or tantalizing, but rather strait forward. The taste was a bit better. A dry grain mixed with a bready/biscuit malt that gave it a negligible toastiness. Somewhat bitter to coerce a fresh, clean, crisp bite. The mouthfeel was medium to medium/light. Smooth, dry, thirst quenching and very refreshing. A inconsequential amount of flavor was left on the palate only for a brief moment, but I’m not sure a “refresher” of this type would require an abundance. This beer is a true “warm” climate beer. Easy to drink, refreshing and thirst quenching. It’s pretty good and fairly well balanced. I’m not under the delusion that this is a world class beer, but sometimes the situation calls for something a little less provocative. In all actuality, I would say this a step above a “macro” and it was a nice little change for me. I think it’s important to have an easy going beer on occasion. One to just drink and not ponder over too much. I wouldn’t go out of my way to try to find this beer, but if you see a single on the shelf, pick it up and give it a go. Judge for yourself. What do you find to be a great Summer brew? Please feel free to leave a comment if you have a suggestion.